In July of 2009 I made an order to Black Tree Designs. When the package arrived it was missing a couple packs. I waited for the back ordered minis to arrive, waited, and waited. A couple months later I emailed to see what was up. John, the head guy at the Texas location apologized for the delay and offered a free pack as compensation. I patiently waited some more, and nothing arrived. I received no further response to my emails after that. I gave up. Today I got a little package in the mail. It was my missing Hundred Year's War minis with a very apologetic letter from John. Apparently the UK location only just produced these models to him. In 2010 John had promised me two free packs to make up for the long delay, but apparently these were forgotten. It was way too long of a wait, yet Black Tree finally made good on my original order. 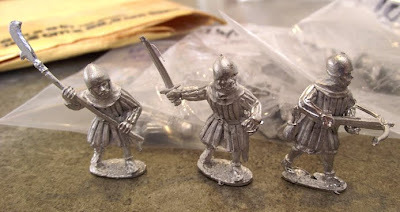 I bought these models to serve as town guards for my Ultima XXVII game. You can see I painted a small detachment of Britannian Guards in 2008. This project has been shelved for a while. In fact, all my mini-painting has been on hold since February. I'm still reading a lot, so you can expect more book reviews soon. Yeah, I had a similar experience with BTD last year. I ordered their Briton Army Deal sometime in July and got it in September. However, it was an extraordinary deal and Jim was also apologetic. In my case, it was worth the wait, but yeah it was a wait. Well I hope Black Tree Designs has gotten better, for I took a look at their figures and really like their figures. Sorry you had such a hassle, but hopefully I won't have the same experience.